How Do I Update My Faculty and Staff Profile Page? Welcome. This tutorial will quickly show you how to log into CCI’s Site Manager network to access and update your Faculty/Staff profile. For more information about the network, please visit our FAQ. If your name exists in the CCI directory, you have already been granted login access to this system. Simply navigate directly to https://directory.cci.fsu.edu/wp-admin/. 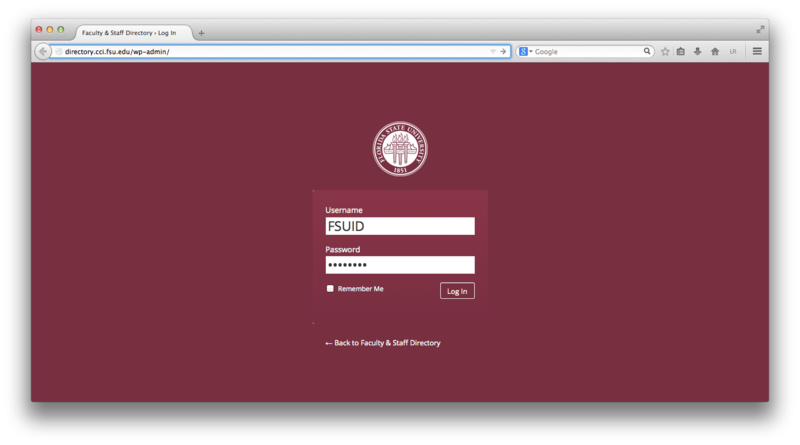 When prompted, please use your FSUID and password. This is the same login and password you use to access Canvas. If you receive an error message after submitting your login, please verify that you entered your login and password correctly. This system is case sensitive. If after those attempts you are still unable to get access, please contact the CCI Help Desk. They are available by email at help@cci.fsu.edu or by phone 850-644-8108. They should be able to assist you in diagnosing the problem. Chances are, after you successfully login you will automatically be at your profile page. In case you are not you may select Profile from the navigation bar on the left or by navigating directly to https://directory.cci.fsu.edu/wp-admin/profile.php (If you have not already logged in, you will be required to do so). The profile page will have several fields that you are able to fill out. At the very least your name, email, phone, office, and department should have already been filled in. If any of the information is outdated or incorrect, please change it and select Update Profile. No changes will be made to your public profile without saving. All users are encouraged to have a phone and office location listed. If you do not wish to have this information in your public profile, please use the phone and office of your department front desk. We encourage you to add a professional photo, Twitter or Linkedin, and especially your academic background and interests. 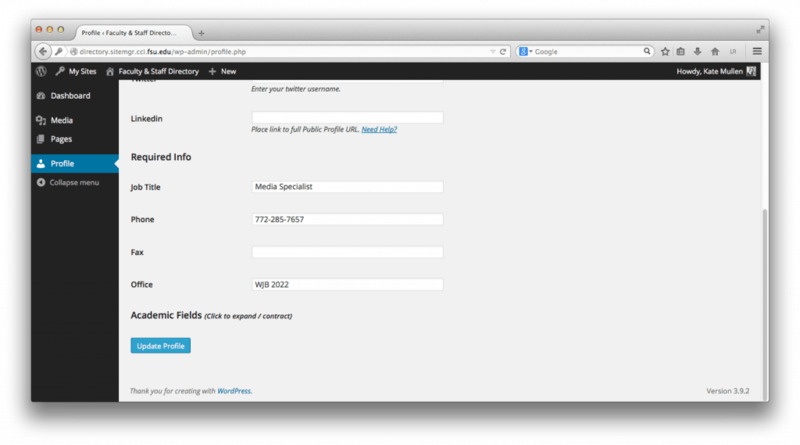 Please note that blank fields will not be shown on your profile. This allows you to customize your profile with as little or as much information as you would like to share. Many of the fields in the Recommend Fields section are rich-text editors. 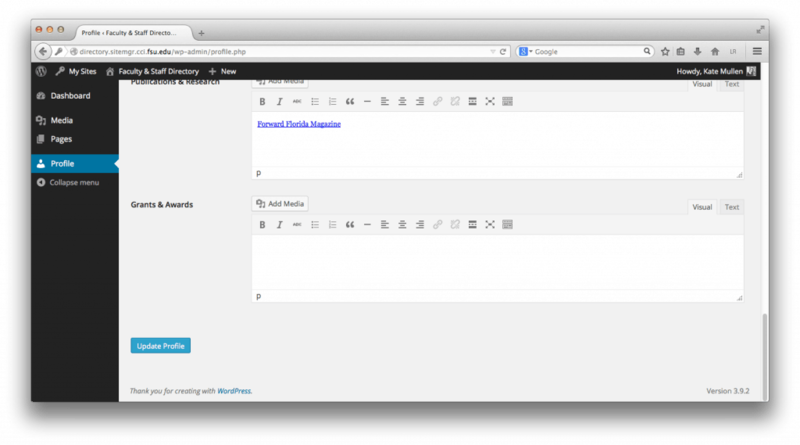 This means you can add styles to your text and they will carry over onto your site. You can do this without any use of HTML. However, if you would like to tinker with it, you are welcome to edit the HTML on any of these fields by clicking the Text tab. If the editing window is too small, you can expand it by clicking and dragging the lower right side of the text box. If you are adding any links or social media pages to your profile, please verify that the links were correct. You can do this by testing the link on your live profile page. To view your real profile page, navigate to https://directory.cci.fsu.edu/directory/ and click on your name. After you have made any changes you would like, remember to click Update Profile to save your changes. If you continue to have any issues with your profile, please do not hesitate to contact the CCI Webmasters at webmaster@cci.fsu.edu.